On March 13th, Chinese Ambassador to Iceland JIN Zhijian invited H.E. 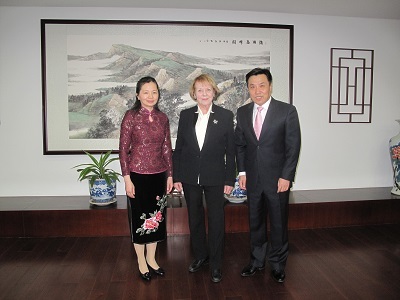 Vigdís Finnbogadóttir, former President of Iceland to his residence, where they had a sincere and friendly conversation on China-Iceland relations and issues of common concern. Ambassador JIN recalled his wonderful study and working experiences in Iceland at young age, especially his participation in the reception of Vigdís’s state visit to China in 1995. He expressed his appreciation and gratitude to Vigdís for her continuous interest and support of the development of China-Iceland relations over the years. Ambassador JIN also briefed her the latest developments in bilateral cooperation in various fields, wishing she could continue making contributions to this relationship as “an old friend of the Chinese people”. Vigdís joyfully recalled her two visits to China, saying that the mutually beneficial cooperation between Iceland and China in various fields enjoys huge potentials and broad prospects. She pledged her continued support and contribution to the friendship of Iceland and China, hoping to see closer relations between the two countries.